The Aero Precision state of the art M5E1 platform starts here, with the M5E1 Upper Receiver. 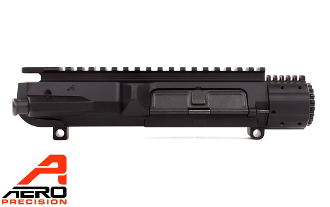 The M5E1 upper receiver is a one-piece design combining the handguard mounting platform with the upper itself. Through superior engineering, Aero Precision has condensed the parts needed to mount a free-floated handguard to a mere 8 screws. Since the handguard mounting surface and upper are of the same forging, not only is it a stronger system, but we are able to make additional lightening cuts to save weight and allow for more efficient cooling.